Grab a pack of friends, slather on some sunscreen and head to the annual Delta Fair and Music Festival to complete assignment #247 in the 365 Things to Do in Memphis. 1. Eat some kind of food on a stick. Do you have any idea how many different varieties of foods you can get on a stick at the Delta Fair? I don’t have an exact number, but my guess is that there are more than a dozen food items – including chicken, coconut shrimp, apples, bananas and sausage – that have been skewered for your enjoyment. 2. 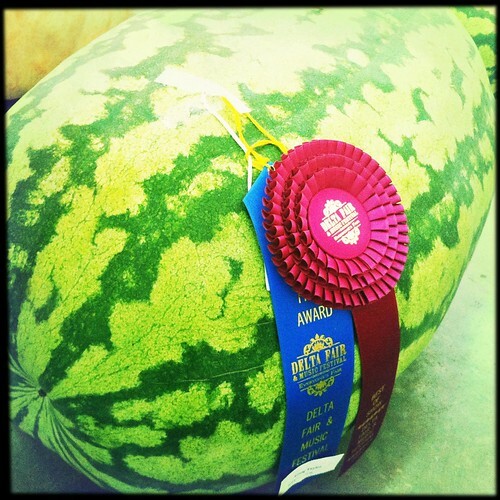 See the 200-pound watermelon. The Delta Fair isn’t just about rides and bands – it’s also about domestic competition. Take a few minutes and walk through the air conditioned wing of the Agricenter that houses the fair’s cooking, crafting and gardening competitions. You can see award winning cakes, insanely intricate handmade clothing, student art work, paper plates of okra and peppers and two seriously large watermelons. 3. Go to the petting zoo. 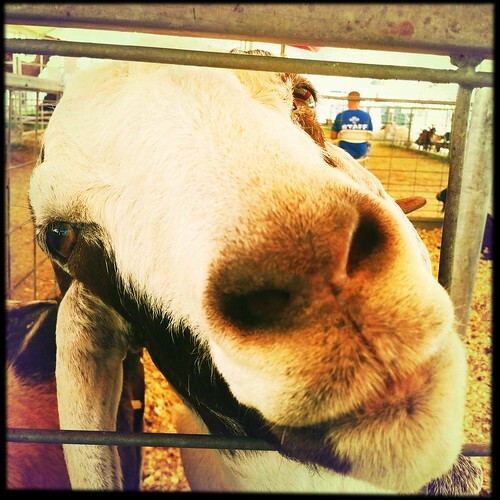 All of the attractions on the Delta Fair’s midway require tickets except for one – the petting zoo. It’s completely free and the adorable goats will warm hearts hardened by long lines and heat. If goats aren’t your thing, you can also befriend an osterich, a water buffalo, several cattle and a camel. 4. See the classic cars. Here’s another thing you can do when you need a break from the heat: go inside the Agricenter to check out the classic car show. There are cars ranging from Model T’s to Bel Airs to one franken-vehicle called the Hillbilly Limbmozene. 5. Do at least one silly thing on the Midway. Ride the Ferris wheel. Take a ride on the giant, swinging pirate ship. Pet a llama. Go into one of the fun houses. Pay 50 cents to see the mermaid or obey the recorded hype man outside of the freak show (“She’s 27 inches tall and alive on the inside! Mermaids’ favorite color is yellow!”). See the giant pig, play some games, let someone guess your weight. Compete in some pig wrastlin’. Just do something silly and fun that you wouldn’t normally do. The Delta Fair and Music Festival usually lasts a couple of weeks and hours vary by day. You can get adult tickets for around $10 and kids’ tickets for around $5, but prices vary each year. Parking is usually $5 and you can get a wristband for the rides, too. Originally posted Sept. 4, 2012. Updated 2018.